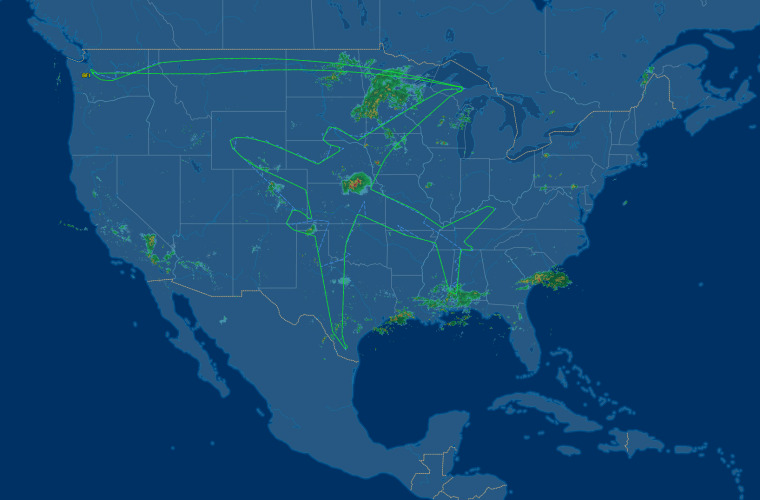 Pilots on a Boeing aircraft spent their test flight drawing a giant outline of the Dreamliner plane they were flying. The test flight lasted 18 hours and the shape of the 787-8 plane spanned across 22 states, according to FlightRadar24. The air traffic tracking service invited people to track the plane's journey live on its Twitter page. The purpose of the Extended Operations test was to see if the Rolls Royce engine could safely run for an extended period of time. Boeing said in an emailed statement that the nose of the aircraft pointed at the Puget Sound region which is the home of Boeing Commercial Airplanes. The wings were drawn over northern Michigan, the Canadian border and southern Texas while the tail touched Alabama. The plane traveled a total of almost 10,000 miles, according to Flightradar24. But while the flight pattern is certainly impressive, it was not spontaneous. “A test flight is not a random event in which pilots just choose to fly any flight path they want for any length of time," said former corporate pilot and adjunct flight instructor Anthony Roman. Boeing’s test pilots are all engineers and they have very specific protocols to follow, according to Roman. He said multiple computers and other engineers would have been constantly monitoring the flight. Roman called the act a “stunt” and said it is likely the idea to mimic the shape of the Dreamliner originated from Boeing’s marketing and public relations department. This isn’t the first time Boeing has gained social media attention with its unique flight patterns. Flighradar24 reported pilots aboard a plane in February spelled out “MAX” for their testing of 737 MAX 8. These flight patterns can be marketing ploys, but experts say it’s safe since the FAA clears all flight plans. Roman said the FAA and Boeing’s engineering department have to approve all the flights they conduct and the specific navigation waypoints that will be passed. Roman said flight routes are highly disciplined and technical affairs — even when they are trying to attract attention.